30-year-old kishan is suffering from end stage Renal diseases and he requires regular dialysis followed by a kidney transplant in order to survive. The total cost of the treatment is around 12lakh Rs. This amount is far too high for our family to afford and he needs your help to get the treatment he deserves. We have exausted all our savings and funds for his treatment till date .We humbly request the kind hearted donors to lead your helping hands to save his life. Words are not enough to show the gratitude to all the kind hearted donors , we would like to thank all the donors from bottom of our heart for your generous contributions . All your contributions will be used for the further treatment and dialysis until we get a matching organ for transplantation . Thank you so much for blessing Kishan with your love and support. He is admitted in the hospital right now for dialysis. 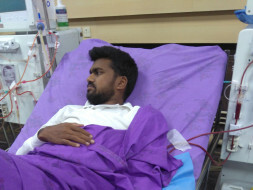 He undergoes dialysis twice in a week, According to the doctors, he must be on dialysis thrice a week but since there is a shortage of funds, he goes for dialysis only twice a week. He is under observation because both his kidneys have failed and his blood count has also dropped. He is on the wait list for kidney transplant but has had no luck yet. The doctors say that he will have to wait for a bit before undergoing the transplant because he has hypertension and his blood pressure is also not under control. He is an anemic and is being given tablets and injections to improve his blood count. His blood pressure should also be under control for him to undergo the transplant. It is my humble request to please keep him in your prayers and please keep sharing the campaign so we can help him get better fast.